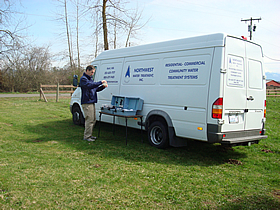 Free Well Water Analysis in greater Kent / Seattle areas WA by Northwest Water Treatment. If you use well water in your home or community in the service area listed below right, are disappointed with your water quality, and ready to take action to improve it - you are eligible for a free, no-obligation, on-site well-water quality testing and analysis. Quality testing and analysis enables us to determine the causes of your water quality issues and how to affordably solve them with a water treatment system so that you can enjoy delicious well water and sparkling fixtures. Hundreds of Puget Sound home owners and community members who thought they were stuck with poor quality well water now enjoy delicious water and sparkling fixtures - thanks to their new custom water filtration and treatment system. Your water quality issues can be solved, too. The first step is a no-obligation on-site water quality analysis. After testing you will receive a no-obligation fixed-fee quote for an affordable, custom well water filtration and treatment system that will solve your water quality issues. If you desire, you could be enjoying delicious well water within one week. With the purchase a complete water filtration and treatment system your satisfaction is guaranteed! Your free water quality test will be done in-the-field and will include the common culprits behind most water quality issues, such as alkalinity, iron, manganese, pH (acidity), Sulphur, tannins, water hardness, and total dissolved solids (TDS). Some situations require lab analysis. Lab analysis for well water certification or health-related concerns. In some instances, well water testing must be done by a certified lab, click here for details. Do you live outside our service area? (See service area city list at lower right) If so, a reasonable travel fee will apply; we will let you know the amount when you schedule your free in-the-field well water testing. If you are on municipal water and have questions or concerns about your municipal water quality, please contact your water municipality for a consumer's confidence report. If you still have water quality issues you would like to resolve such as hard water, chlorine removal, staining, UV sterilization, or purity of your water, please request a free in-the-field water testing and analysis. Call 253-630-7177 now or use the convenient form below. You will receive a reply to your online request within 24 hours on business days. Required fields in *red.